Offer your customers a virtual sea of flowers in spring with Sweet Ocean. This fragrant, multi-flowering variety features fluffy double centers that create quite a display when in full bloom. With a gorgeous, full form and snowy white petals that are generously washed in hues of yellow to orange to pink, they fill up sunlit borders and beds with beauty and a sweet springtime scent. 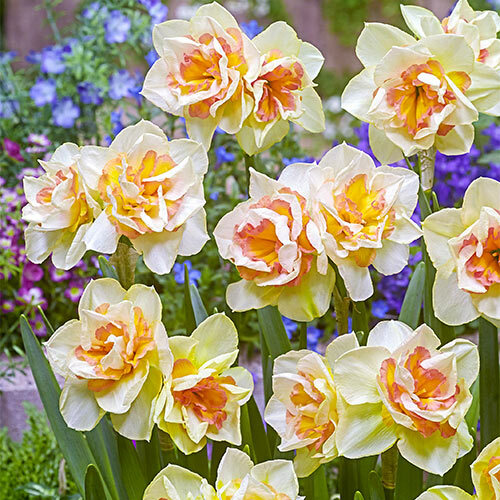 Suggest that customers plant these lovely daffs toward the front of their borders or along a well-traveled walkway for maximum impact. They grow to a moderate 12-16", making them the perfect height for those particular sites. They also add charming color to woodland areas, decorative containers, fresh-cut floral arrangements or mixed bouquets. They naturalize well and return yearly with ease. Multiple flowers per stems, each flower is approx. 3" in diameter.